If a pregnant woman uses her safety belt correctly, the foetal injury risk is reduced significantly. 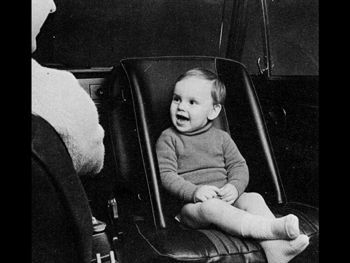 This knowledge stems from Volvo Cars' research on car safety for unborn babies and their mothers. Volvo Cars has developed a virtual crash test dummy to simulate frontal impacts during pregnancy. Car safety for unborn children is an area that is not well documented, since foetal injury and death often do not show in statistics. For the baby to remain unharmed in a car crash it is important with safety measures for the pregnant woman. The first thing to do is to always wear a safety belt, and yet not all women do. Volvo Cars contributes to an increased awareness of safety for pregnant drivers and knowledge of how to protect their unborn babies. One innovation in this field is a virtual pregnant crash test dummy. The model can be used to simulate how a pregnant woman moves in a crash and how the foetus moves inside her. Her proportions correspond to those of an average sized woman in the final stage of pregnancy, approximately week 36. The virtual crash test dummy is used to simulate impact tests in frontal collisions. the safety belt and airbag affect the woman and the foetus, including surrounding structures, says Lotta Jakobsson, Child Safety Specialist at Volvo Cars. This means that the engineers can simulate the impact on mother and unborn baby in collisions at different speeds, and use the model to test for example safety belt designs under development. - Remove bulky clothes so that the safety belt can be placed as close to the body as possible. - Pull the lap belt over the thighs, lying flat under the belly. - Make sure the torso belt is positioned between the breasts. The positioning of the safety belt is important so that the occupant is restrained over the body's stronger areas - like the upper torso and pelvis - thus protecting the weaker parts of the body, such as the soft abdomen containing the fragile foetus. 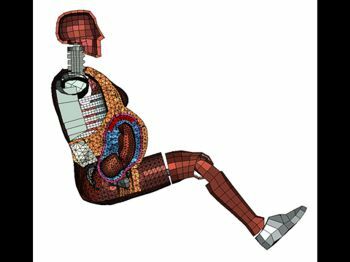 Studies on the virtual pregnant crash test dummy show that the driver airbag offers protection for both the mother and the foetus. Injuries unique to pregnant occupants involved in crashes include placental abruption, uterine rupture or laceration and direct foetal injury. The most common type of injury is a separated placenta. The placenta then becomes partially or completely detached, meaning that the baby can not get enough oxygen and nutrients, which can be fatal for the baby. - Our research shows that the best protection for pregnant women and their unborn babies is for the mother to wear her three-point safety belt, and to wear it properly. This reduces the foetal injury risk significantly, says Lotta Jakobsson. First adjust the seat so you can reach the pedals comfortably with as much distance between your belly and the steering wheel as possible. Pull the lap belt over your thighs, buckle it in and pull tight. Make sure the lap belt does not run across the belly, but lies as flat as possible under the curve. Position the torso belt across your chest, between the breasts to the side of the belly and pull tight. Never tuck the shoulder belt under your arm or behind your back - that can hurt both you and the baby. - The finite element model known as the virtual pregnant crash test dummy was developed by Volvo Cars, the first of its kind. - The model contains layer upon layer with detailed information about the uterus, placenta, amniotic fluid and foetus in approximately the 36th week of pregnancy. - The dummy can be positioned in any car model and simulate collisions at different speeds. 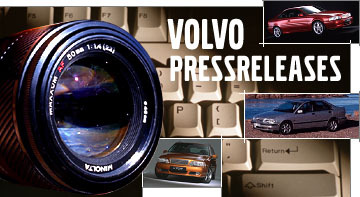 - This has brought Volvo Cars to the important conclusion that pregnant women must always wear the safety belt and make sure to wear it correctly. - Volvo Cars has also concluded that pregnant women are better protected in frontal impacts with an airbag in the steering wheel than without.